The Most Expensive Meals Of The World - Food For Thought Or Your Wallet? When asked about the most basic needs of a person, we always answer with food, clothing and shelter. But what if that individual isn’t basic but a billionaire? Food is still going to be his most important need, but not just any meal will do. Here is a menu of the world’s most expensive meals for those who have midnight cravings for luxury as their palettes deserve only the finest! This meal was cooked up by Pink Caravan at Galleries Lafayette in Dubai Mall for a good cause, so if you have a generous heart and don’t mind the calories to help raise awareness for breast cancer, this is the burger for you! What’s more interesting is that it was created without the use of any super exotic ingredients by Sheikh Mohammad bin Abdullah Al Thani, Chairman of the Department of Statistics and Community Development in Sharjah. 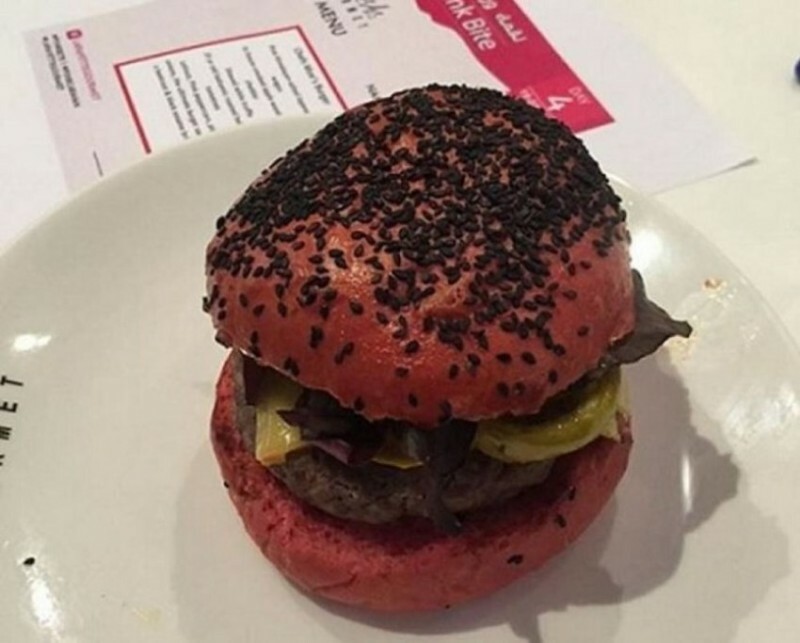 Pink Bite burger also shattered world records for the most expensive burger ever sold! 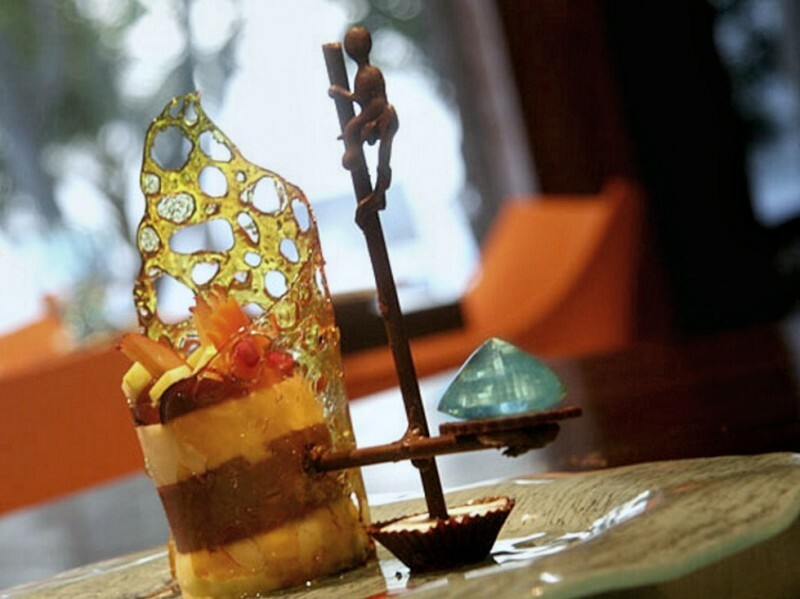 The DUO restaurant at the Fortress Resort & Spa in Sri Lanka is the birthplace of this sinful dessert. The dessert has a gold leaf Italian cassata, along with mango and pomegranate compote and Irish cream infused fruit. It is finished off with Dom Perignon champagne sabayon on the top and is served on a platter adorned with 80 carats Aquamarine stone. The indulgence doesn’t end here- it also comes with a handmade chocolate carving of a fisherman holding on to his stilts! With a dessert like this who needs dinner? Luxury jeweller Euphoria New York and Serendipity 3 came together to breathe life into every dessert lover’s fantasy! The dessert is made with 28 different types of cocoa with over a half of them being the world’s most exotic ones. 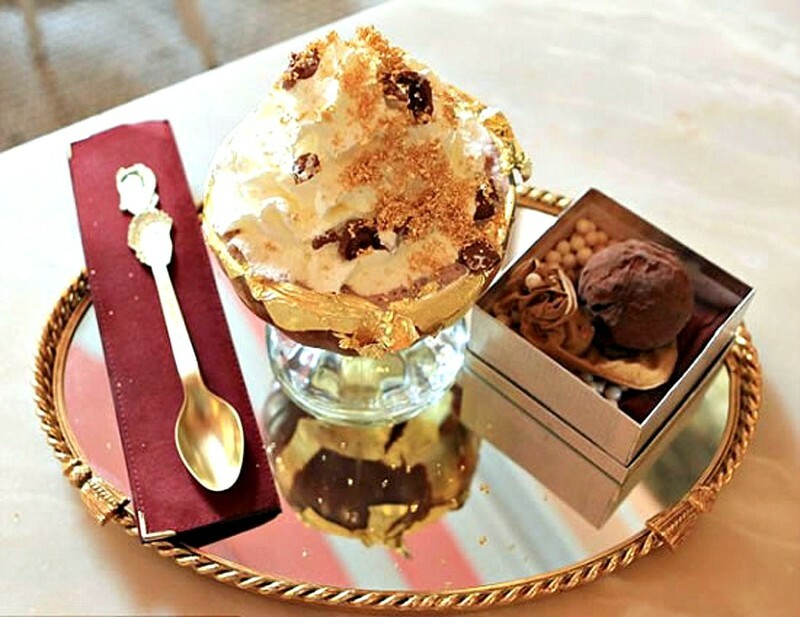 The ice cream is infused with 5 grammes of 23 carat gold and is presented in a goblet lined with edible gold. The sparkle continues with an 18 carat gold bracelet adorned with 1 carat white diamonds that are all around the goblet. This divine dish is served with a topping of gold covered whipped cream and a La Madeline au Truffle from Knipschildt Chocolatier. When the ice cream is a Guinness Record holder, it is only befitting to eat it with a gold spoon decorated with white and chocolate-colored diamonds! What makes this chocolate pudding so exorbitant? 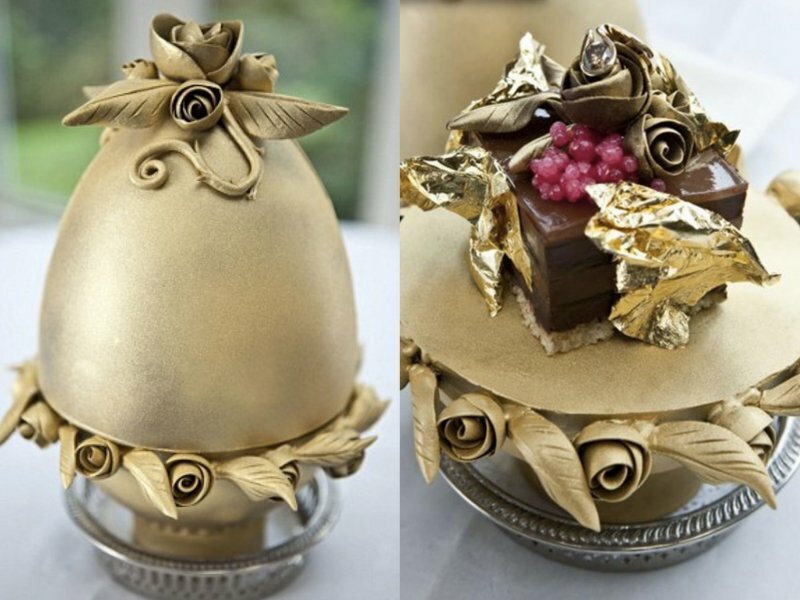 Chef Marc Guibert at Lindeth Howe Country House Hotel in England designed his masterpiece to look like a Faberge egg. 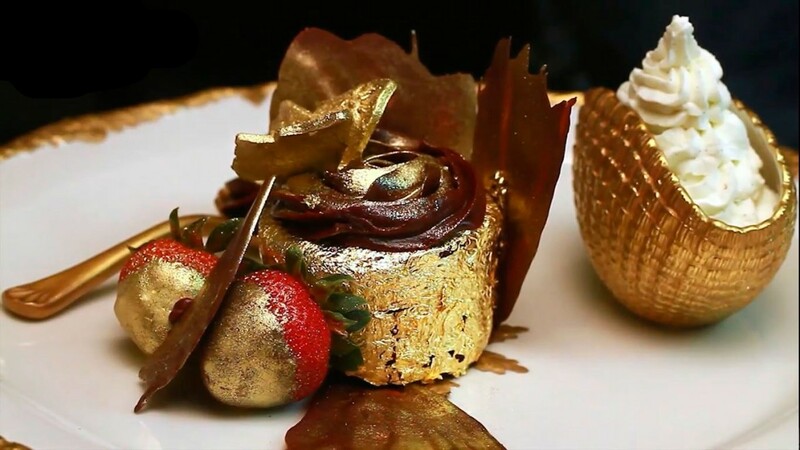 This chocoholics dream is covered in gold leaves, champagne, caviar and a 2 carat diamond for the luxurious experience that your taste buds deserve. Layered with champagne jelly, biscuit joconde and glazed with edible gold, this dessert fit for royalty will hit all those sweet spots in your palette and bank account! 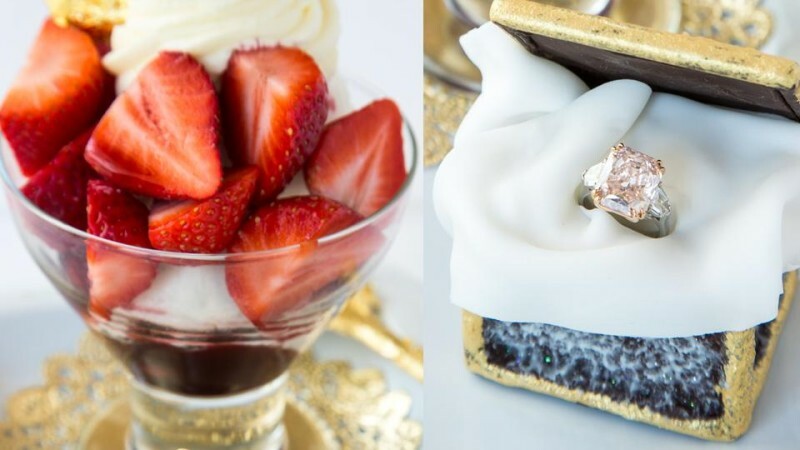 Arnaud in New Orleans is home to the world’s most expensive dish, Strawberries Arnaud which was actually a proposal package created by Katy Casbarian and MS Rau antiques. The dessert consists of strawberries served in a marinade of spices, citrus, red wine and port with vanilla ice cream. Wonder why is this dessert worth millions? Well, it also comes with a 7.09 carat pink diamond, after all, this dessert is going to change someone’s life into a very happily ever after! After all, you are what you eat!